Old fashioned Brain's pub on the city's main shopping street. It has a long, thin interior, with a similarly long bar. Brain's Bitter & The Rev James were the 2 ales. A fair few blokes were in on Wednesday morning. But, the only women were the barmaids. We soon continued around the corner into Church Street for the newly-opened Head Of Steam and a craft beer bar called Beelzebubs with Crafty Devil beers. I'll ask for them both to be added. What can I say ? Pubs should be judged on subjects like their welcome, their choice of beer and the general ambience. Well this pub could be overlooked as just another very busy, city centre place full of loud music and odd customers. In its defence however, this was one of the highlights of the night. Loud music yes, but the locals were friendy and had far more 'characters' than a hundred souless places I can think of. 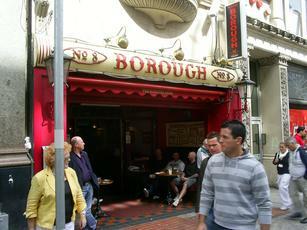 If you are up for a laugh, and enjoy your pint at just £2.10, then have one in here, you could do worse. Beer Ok but wear a crash helmet when bluebirds are playing at home. I can't believe everyone is slamming this place off! It's a brilliant place to start your night if you cant be bothered with all the little kids in places like Varsity and Lloyds. Yeah, alrite music can be cheesy before half 8, 9 but who goess to town that early? !